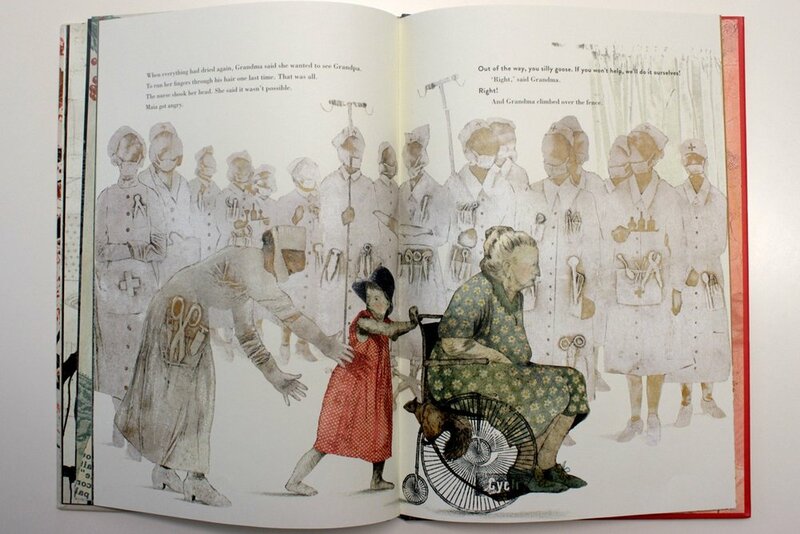 I examine the depiction of love and loss in this intricately illustrated book by Belgian artist Kaatje Vermeire and writer Tine Mortier. This book called out to me from a sea of children’s books. I was immediately drawn to the intricate cherry blossom tree on the cover and the powerful title, which leads to the curious question what matters to Maia? 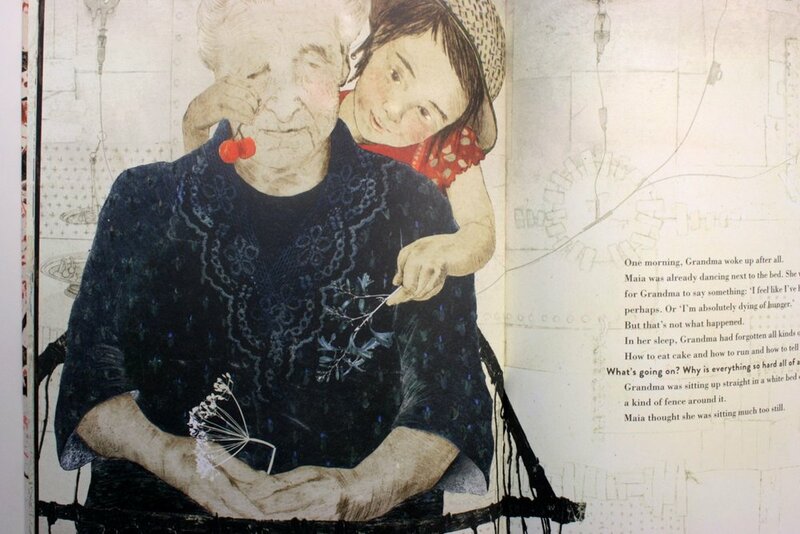 Maia and What Matters is a touching tale of two kindred spirits from different ends of the age spectrum: a girl and her grandma. Two greedy, impatient and slightly tricky characters whose journey of climbing trees, shouting at birds and being covered in sticky sugar crumbs becomes interrupted by the cruelty of life’s hardships. In this case, the death of Maia’s granddad but also a dramatic change in her dearest friend, when her grandma suffers from a stroke. 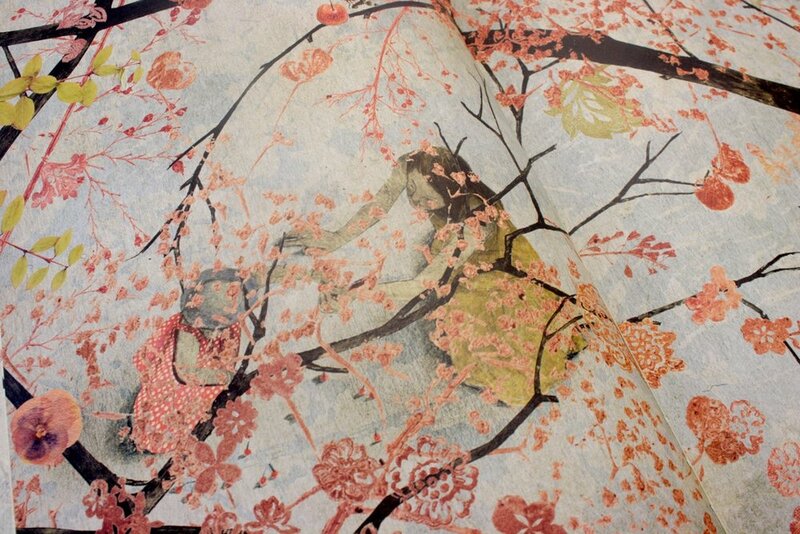 Tine Mortier and Kaatje Vermeire tackle the complicated task of this subject matter with such openness through the boldness of the words ‘Grandpa had broken a teacup and stopped living,’ and the stark contrast in the illustration which sees hues of peach, washes of blue and bottle green turn into sepia toned silhouettes. Even at its bleakest moments however, the cherry blossom tree which features from the very first page ‘Maia was born under the cherry tree in a wicker chair’, deliciously echoes its way throughout the book, giving a glimmer of hope that what once was, could be again. What we begin to see however, is that Maia is exactly what her grandma needs, and in turn the illustrations begin to turn again from dark colours to beautiful ink blues, becoming laden with nostalgic, timeless vintage patterns and motifs reminiscent of Mrs Beeton’s cookbooks amongst child-like drawings, merging the two generations. 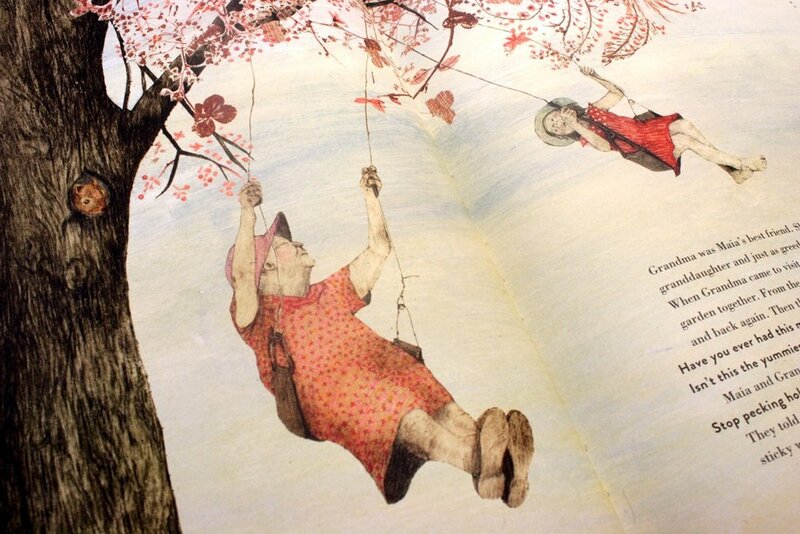 The result is a heartwarming book which perfectly blends the joy of childhood with a depiction of the beauty of loss. It bravely depicts what we all have to go through, quite often in childhood itself, but through magical lenses. So what matters to Maia? Essentially what matters to everyone: friendship, love, the ability to adapt to what life throws at us, our imaginations and the consumption of the occasional slice of cake.